I don’t know about you guys, but I am SO. READY. for Spring! Anything that is bright and light is very appealing right now. 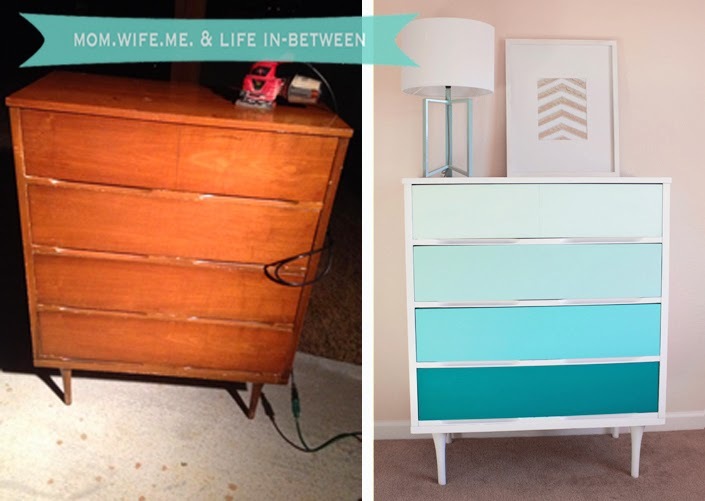 So when I came across this incredible mid-century style ombre dresser from Lexie at Living With Lexie, I was smitten. What’s even more incredible – she found it for $35 on Craigslist! I love the bright punch of color the dresser brings to the space – so cheerful! Since this piece was for her little girl’s room, Lexie used a paint chip and got samples of each of the colors in case she needed to touch up the drawers – so smart! I’ve been thinking about changing out the dressers in my bedroom, since they’re just not fitting into my room as it’s evolving. As Lexie mentions in her post, refinishing or painting a thrifted dresser is a great way to get a completely custom piece without breaking the bank. And if it doesn’t quite turn out, no big deal! I’m keeping my eyes out for a great piece – and I’ll definitely keep Lexie’s tips in mind. Check out her full tutorial here! I have absolutely no formal design training. I just love to rip out, build up, take down, paint over, and reupholster ... it makes me happy. I started this blog so I could interact with other design and DIY lovers - so I'd love to hear your thoughts, advice, and inspiration! Before and After: My favorite piece of furniture so far!